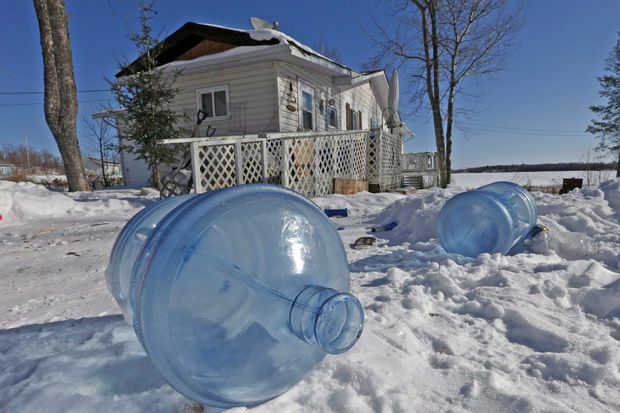 The Shoal Lake, Man., community, despite supplying water to the city of Winnipeg, has been under a boil water advisory for years. Eight years ago, the state government in Michigan was forced to take over the financial affairs of the city of Flint, which had fallen on hard times and been run into the ground through ineptitude and gross mismanagement. In what was deemed a cost-saving move, officials decided to build a new pipeline to deliver water from Lake Huron. Meantime, the city turned to the Flint River as its source. Not long after the switch, residents began noticing something odd with the water: It looked, smelled and tasted funny. It would later be determined that it contained dangerous levels of lead, which can, and did, lead to a plethora of health issues. Twelve people died after more than 80 people were infected with Legionnaires’ disease. The sight of residents in the largely black community lining up for bottled water became worldwide news. There was outrage over the fact that in the 21st century, Americans couldn’t count on getting access to water that was safe. It took a few years before the people of Flint could once again count on that. In 2017, the Michigan Civil Rights Commission issued a report linking the scandal to systemic racism. The study presented the view that the response to the crisis would have been much different had it occurred in a wealthier, white city. We mention this because here in Canada there are villages and reserves, almost exclusively Indigenous, that continue to exist under long-term boil-water advisories. The water isn’t reliable enough to drink on its own, so it must be brought to a boil for a full minute before it is. Remarkably, the Neskantaga First Nation in Northern Ontario has been under a water advisory since 1995. For the Shoal Lake 40 First Nation, which straddles the Manitoba-Ontario boundary, it’s been 20 years. That is our national shame. To demonstrate how strongly he was committed to solving the problem, Mr. Trudeau assigned one of his top ministers, Jane Philpott, to the file. However, she was recently shuffled to the Treasury Board and her challenge became Seamus O’Regan’s. While some headway has been made, there are still too many Indigenous communities that can’t tap into the same safe resources that the rest of us can. Access to a dependable water supply is a fundamental right that many in this country have been denied for far too long. When the Liberals took office, there were 105 boil-water advisories that were active. Since November, 2015, 78 have been rescinded. However, there have been several new ones initiated in the meantime – it’s like a game of whack-a-mole. Right now, 62 long-term advisories (ones in place for more than a year) remain outstanding. However, there is a good chance that number will soon shoot up when Health Canada changes the status of the mineral manganese – found in the water in many Indigenous communities and currently considered safe. There are now believed to be negative health effects associated with the chemical element. There is also concern the changes that were made that allowed some of the advisories to be lifted were just temporary fixes. There are long-term, structural problems with the water treatment systems in many Indigenous communities that have not been addressed. Many of these places lack the proper equipment needed to remedy the operational issues with which they are confronted. Certainly, many of these villages are remote, fly-in only. Getting heavy duty machinery into them is not easy, and has been a factor in some of the delays. But you can only use that as an excuse for so long. It’s more difficult to rely on as a reason when you’re talking about communities that haven’t had access to safe drinking water for 25 years. And while that situation is particularly absurd, there are many Indigenous people that haven’t had good, reliable water to consume for several years. There have been documented deaths in Indigenous communities related to bad water, but we barely hear a peep about them. Of course, if this was happening in anything resembling an urban centre in Canada there would be a national uproar. Remember Walkerton? Which leads to the question: How much does racism play in our water crisis in Canada? Is the situation here Flint, Mich., writ large? Based on the best available evidence, it’s difficult to conclude otherwise.